Let us introduce you to the world of the Ancient Greeks through archeological promenades and guided tours to the most magnificent historical sites in the city of Athens, the Greek mainland, and on the magical islands of Mykonos and Chios! Our tours are dynamic in the sense that they can be adjusted upon your request to fulfill your customized needs and preferences! 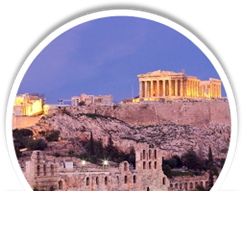 Please find below the highlights of Athens and select one or more sites to create and book your own fascinating, private guided tour and discover the glorious history of the Greek capital, the cradle of the western civilization. We offer walking guided tours in the historical center of Athens as well as driving guided day tours and excursions to destinations outside Athens. Book your tours for Mykonos or Delos and discover the gems of Cyclades! Book a tour for Chios, the gracious Captains' island of the Aegean! We are a group of professional certified tour guides that share the same vision - to introduce and promote Greek culture and tourism to our esteemed visitors. 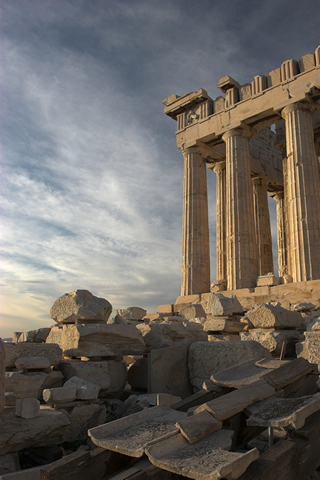 Contact us to arrange your exclusive tour and have a memorable experience in Greece! The elegant temple of Athena Nike, dedicated to the victorious goddess who helped the Athenians defeat the Persians. The Propylaia, the monumental gateway through which 'mortals' entered the divine sphere of the goddess Athena. The Erechtheion, where Poseidon and Athena competed over the patronage of the city, famous for the porch of the Caryatids. The Parthenon, the highlight of the tour is this spectacular, unique temple which housed the gold and ivory statue of the goddess Athena. According to the archaeologist William Bell Dinsmoor, it is the most harmonious and balanced building built in antiquity. The Herodeon, Odeon (Concert Hall) built in 2nd century A.D. The tour ends with a visit to the Mars Hill, also called Aeropagus where according to tradition St. Paul preached the word of Jesus Christ. * You can visit only the Acropolis or combine it with the other recommended sites or even with a driving tour to Cape Sounion. The Acropolis is an eternal global symbol of an ideal that enlightens humanity and its spirit has been revived in the New Museum of the Acropolis, which constitutes a contemporary architectural marvel. Through its transparent glass walls the visitor of the museum can enjoy a breathtaking view of the Acropolis while admiring the sculptures that once adorned the Sacred Rock of the goddess Athena and its Monuments. The collections of the museum are exhibited on three levels while a fourth middle level houses the auxiliary spaces such as the museum shop, the cafe and the offices. 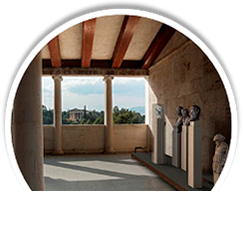 Get to know the history of the Acropolis from prehestorical to roman times through the exhibits of these galleries. 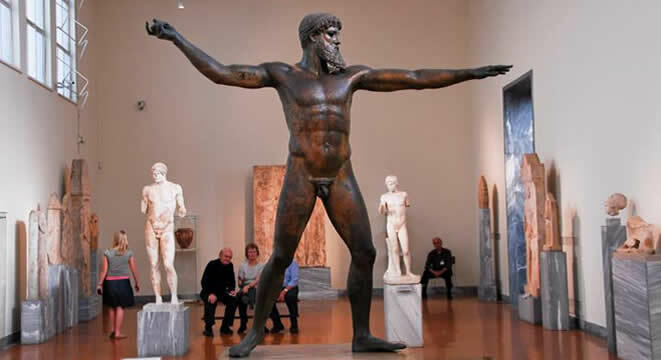 Your tour guide will show the most important artifacts such as the Archaic Female Statues called Korai, the Caryatids, the sculpted decoration from the Temple of Athena Nike and of course the Freeze of the Parthenon which is the highlight of the museum. As the museum is built over an archaeological site, part of the floor, both outside and inside is transparent so that the visitor can see the excavations below. * It should be combined with: The Acropolis / the Acropolis, Theatre of Dionysos and Ancient Agora / the City Tour. It is located at the South Slope of the Acropolis where the shrines of the god Dionysos and the god Asklepios where established in antiquity. 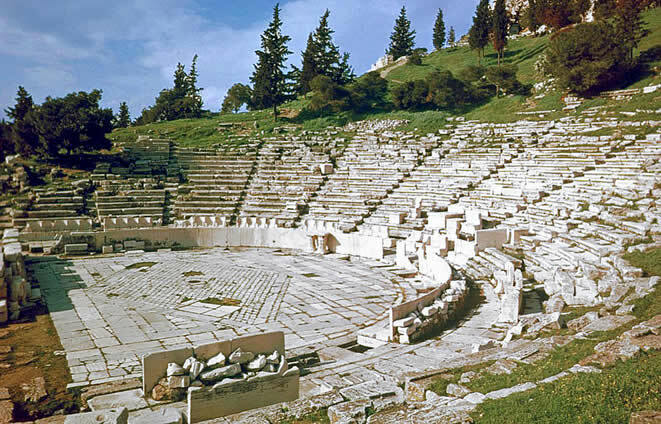 The Theatre of Dionysos built north of his temple used to attract thousands of people during the religious festival, known as the Great Dionysia which among other rituals also included performances to honour the god. Gradually these performances evolved into Tragedies and Comedies and the Greek Drama was born. The great dramatists Aeschylus, Sofokles, Euripides as also the famous comedian Aristophanes had their plays performed in this very theatre. Nearby, we shall visit the Sanctuary of Asklepios, god of medication and health and we shall see the remains of a monumental colonade, built in the 2nd century B.C. * It should be combined with: Acropolis / Acropolis and New Museum / Acropolis and Ancient Agora. A walk around the ruins of the Government buildings, Civic Offices, shops, the prison where Socrates died, the Temple of Hephaistos which is preserved intact, the Stoa of Attalos and a Byzantine church 1000 years old. The site of the Agora is being excavated by the American School of Classical Studies since 1930, who have been working with great devotion to uncover the secrets of this glorious site. * It should be combined with: Acropolis / Acropolis and New Museum / Acropolis, Ancient Agora, Roman Forum and Library of Hadrian. It was constructed between the years 19 and 11 B.C. to accomodate the commercial enterprises of Athens which increased in roman times. It was built during the time of Julio Caesar and Octavius Augustus and became the first organised center of the city. In its proximity still survives, almost intact, the Tower of the Winds, a marvel of the Hellenistic period, in which a hydrolic clock operated and was most probably a meteorological station. North of the Roman Market Place, Hadrian the emperor built one of the most brilliant buildings of the 2nd century A.D. the Library which is named after him. It housed reading rooms and lectural halls and served as an educational center. * It should be combined with: Acropolis / Acropolis and Ancient Agora / Acropolis, Ancient Agora / City Tour or as part of an extended walking city tour. * It should be combined with: Acropolis / Acropolis and New Museum / Acropolis, Ancient Agora, Roman Forum and Library of Hadrian / City Tour. 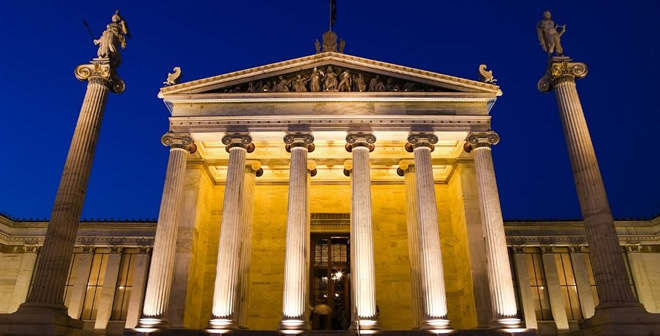 Housed in an imposing neoclassical building of the 19th century, one of the largest collections of ancient Greek artifacts in the world awaits your visit. Get acquainted with all different historical periods of Greece, from the Neolithic period (7th millenium) all the way to the end of antiquity and marvel the treasures and masterpieces the Greeks have created. As it is located a bit further away from the Acropolis you may need a means of transportation which we can arrange for you. Alternatively you can walk there with your guide or meet your guide on the spot. 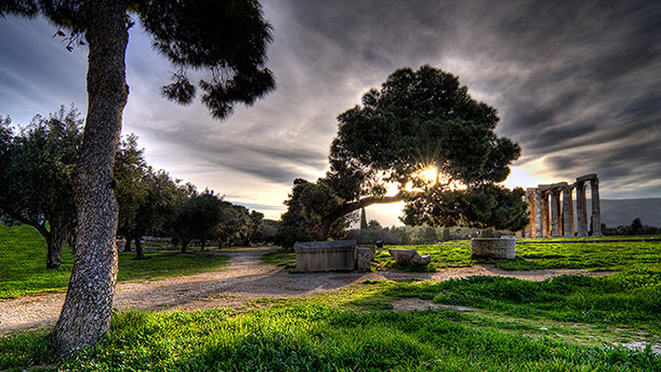 The best way to unravel the history of Athens from antiquity to modern times is to enjoy a private walking tour among monuments constructed in different historical times, accompanied by your tour guide who will give you better insight of the city. Admire the Arch of Hadrian, Temple of Zeus1, Panathinaic Stadium where the Olympic games were revived in 1896, the National Park and a number of Neoclassical buildings such as the Presidential Palace, Parliament, Academy, University and Public Library. Alternatively, you can choose an extended walking tour which continues with a visit to the Plaka area and to the Monasteraki (Flee Market), the old tranditional parts of the city center where you can also see the Roman Forum1 and the Library of Hadrian1. 1. These sites are seen from outside unless you book for a combined tour. * You can have only the city tour or combine it with the other recommended sites. Μykonos is an island which most people will know for its beautiful sandy beaches, wild night life, wonderful restaurants and its vast array of little shops and boutiques. However there is a lot more to this tiny island, in the middle of the Aegean, than first meets the eye!... It is an island which has been inhabited, continuously, for 6500 years. The locals of Mykonos still believe strongly in keeping their customs and traditions alive. It is a place where one can see the beauty of the traditional Cycladic Architecture and stunning views. A tour through the labyrinth of streets that form Mykonos Town and also around the island, will give you the opportunity to see the real identity and beauty of the island and - most of all - to discover the real reason why Mykonos became one of the most famous tourist destinations in the world! Delos is a small island, about 4 miles long and 1 mile wide, just 3 nautical miles to the west of Mykonos. It has been recognized as a World Heritage site since 1990 and for many years the only ones allowed to live or swim there are the guards and the archeologists. In ancient times it was considered to be the birthplace of two very important ancient Greek gods, Apollo and Artemis and at its peak it is thought to have had 25.000 people living there. Until today, only one seventh of the island has been excavated but in that one small area one can see an ancient city revealing itself to them. There are temples, hundreds of statues and ceramic vases, sacred avenues, market places, shops, workshops and warehouses and homes, both wealthy and poor. There are also the remains of an ancient port, a theatre, which could have seated 5500 people and a stadium. There are over 320 mosaic floors still lying on the floors of the ancient buildings. One can enjoy all of the above and much more, while taking a tour of this 'Holy Island', as the ancient Greeks referred to it. Most importantly, Delos gives you, the visitor, the opportunity to walk through history, not past it. * You can choose one of the two tours or make a combination of both. In Chios town we can offer you a walking tour strolling around historical monuments such as the picturesque fortress at the port and the interesting Korais library. Upon your request, we can visit the Archaeological or the Byzantine Museums of Chios. In short distance from the town (a taxi transfer is required) we reach the fragrant Citrus Valley called Kambos and we wander around the admirable medieval mansions. The island is rich in history and there are plenty of monuments and different sites that one can visit. 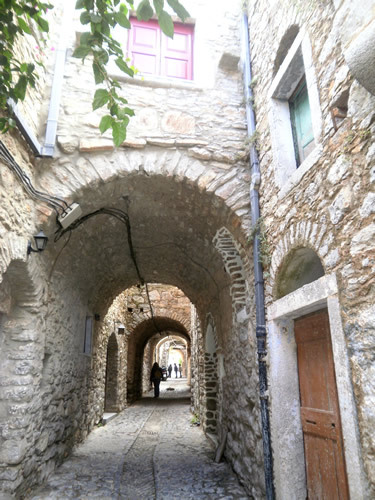 The medieval mastic villages, called Masticochoria, the mastic fields and the magnificent Byzantine Monastery of Nea Moni (Unesco Monument) are the highlights of the island tour which we can offer using a transportation mean that we will arrange for you. Combining a visit to the Acropolis and the New Acropolis Museum will allow visitors to appreciate the true grandeur of the Acropolis' magnificent architectural wonders and visualize its structure in its original form, especially the Parthenon, as part of its famous frieze and sculpted decoration is exhibited in the Museum. Walk around the places where the Ancient Athenians performed their most important activities such as theatrical plays, business transactions, philosophical conversations, political debates, worshipping of their gods, is the best way to fully comprehend the society that set the foundations of the Western Civilization. I want to visit Acropolis New Acropolis Museum Theatre of Dionysos Ancient Agora Roman Agora And Library of Hadrian Temple of Olympian Zeus National Archaeological Museum City tour and click to add a site Acropolis New Acropolis Museum Theatre of Dionysos Ancient Agora Roman Agora And Library of Hadrian Temple of Olympian Zeus National Archaeological Museum City tour and click to add a site Acropolis New Acropolis Museum Theatre of Dionysos Ancient Agora Roman Agora And Library of Hadrian Temple of Olympian Zeus National Archaeological Museum City tour .